We might not get to see Juhi Chawla and Shah Rukh Khan share the screen space in a movie, anytime soon, but we sure can watch them on another screen. The two actors are co-owners of the IPL team, Kolkata Knight Riders. The team was up against Sunrisers Hyderabad for a match at Eden Gardens today. 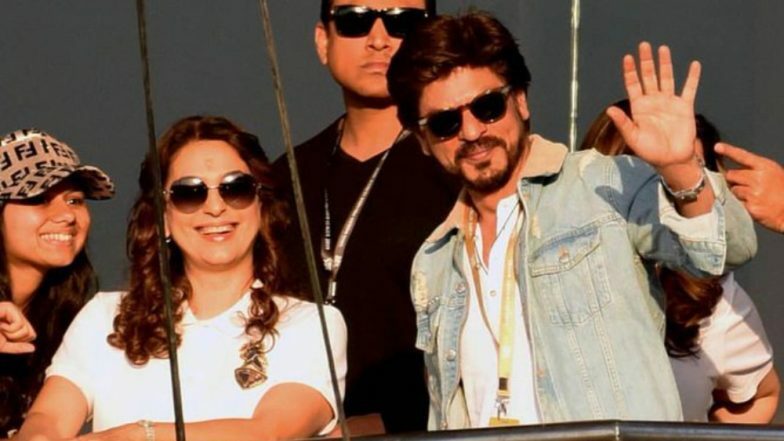 The screen at the stadium gave the audience a peek at how Juhi and Shah Rukh were reacting to their team's performance. And Bollywood buff hearts aflutter. The fans of movies like Darr, Yes Boss, Duplicate will understand how much we miss seeing this pairing on the big screen. This brief appearance on the screen at an IPL match is the closest we have come in years. Shah Rukh Khan and Karan Johar’s Latest Picture at 64th Filmfare Awards 2019 Says All Is Well With Their Friendship – View Pic. The excitement on Shah Rukh and Juhi's faces was very visible. The two team owners even waved for the cameras at one point during the match. The two were simply dressed; Juhi was wearing a white top and beige pants, while SRk wore a denim jacket over a white tee. Dapper and cool. Exclusive! Juhi Chawla Gets Emotional As She Talks About 25 Years Of Shah Rukh Khan's Darr! Juhi Chawla did have a tiny blink and miss appearance in Shah Rukh Khan's Zero, last year. Is this all we will get of the super jodi now? A brief appearance in a movie? And a few pics of them watching a cricket match? We are totally contemplating starting a petition for them to star in a full-fledged movie together. Who is with us? Tweet to us @latestly.